I am a huge fan of Tiny Prints. 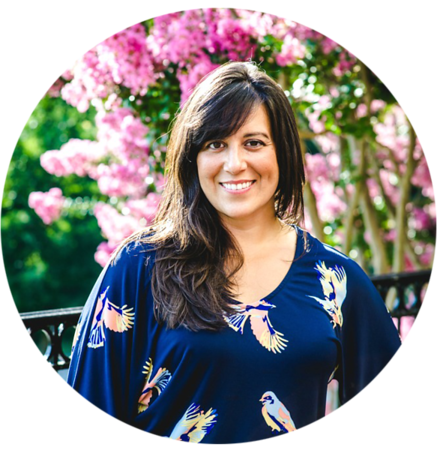 The design selection is unreal (truly a design for everyone), photos can be uploaded directly to the site to create a fully customizable product (that is gorgeous, if I do say so myself--especially with photos in color). They have been a favorite of ours for holiday cards, birth announcements and, more recently, greeting cards. Last year as I searched high and low for Roscoe's first birthday party invites, I found Paper Culture. Their designs are modern, fresh, and so undeniably playful that I couldn't resist. I love how they offer thank you notes (and other accessories) to match their invites, and their customer service is impressive--they worked with me to change the color of the gorilla's behind to better match Roscoe's party color scheme. At the time, they were the only shop in the market with direct-to-recipient mailing--which really is convenient! We also got to write a personal message to our invitees on the back, and the company plants a tree with every order (can't argue with that!). Oh, and the weight of the card stock, with it's big rounded edges, leaves a very nice impression--I didn't want to put them down. 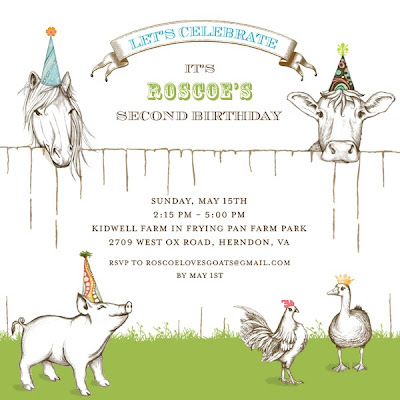 This year, I was hoping to redeem a credit that I have with Paper Culture--ever money conscious these days now that I'm (almost) a stay at home mom--but with an open mind I surveyed the online stationary landscape looking for just the perfect invitation for Roscoe's second birthday party. All this to say that Tiny Prints won me over again (and again for Merritt's birth announcement, but that's another post!). I knew this invite was the invite as soon as I spied it. I'll have to try again with Paper Culture when Fall rolls back around. Either way, you can't go wrong, and while I'm at it, I'll tell you that I'm dying to buy something from Minted. Their birth announcements are so classy. The use of color, the party hats, the beaming little piggy in the corner. It's just perfect for our birthday boy. And I was happy to have space to jot down the itinerary. 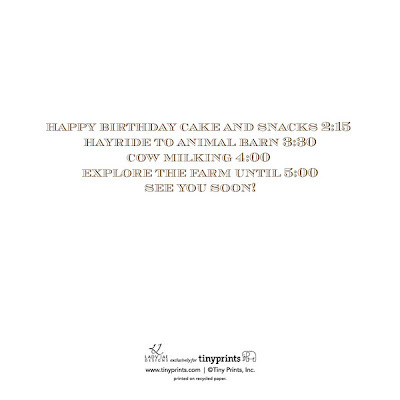 A nice thing about planning a party on a farm is that 75% of the details are already decided given the location, which leaves me with only a few choices to make around decorations and of course the menu is on my mind. Roscoe has requested chocolate ice cream, and a chocolate chip cake, though I have a feeling that he may change his fickle toddler mind a few times between now and then. I'm happy to oblige him, either way. Plus, a chocolate chip cake sounds like a baker's challenge! They are to cute for words!